One of the best and most loved Twitter applications, Falcon Pro, has recently hit the 100,000 user mark that Twitter is enforcing on third-party applications. The developer has pleaded with Twitter to lift the limit and got a response of “no.” He has been trying to work around the problem within the past week. With the update rolling out today, a band-aid has been applied to the problem, but not a fix. After updating, you will be prompted to re-login. This process is quick and should only take you a minute. All your settings, mutes, starred users, etc. will be saved. During the login, the app will check for your Google Play licence. 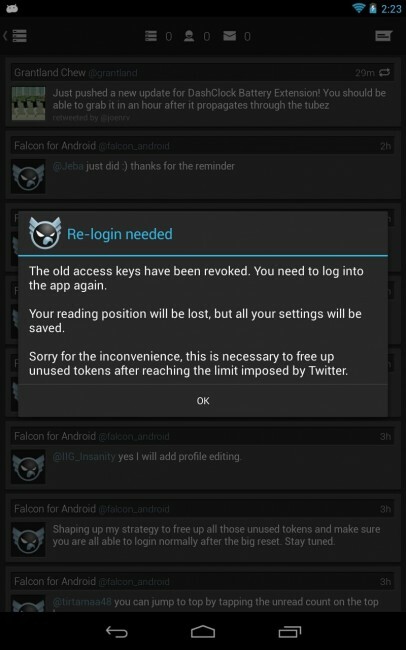 This also will help solve the problem that Falcon has run into with people pirating the app. Users who sideloaded the app should see their feed stop working within the next 24-48 hours. People who haven’t gotten in on this great Twitter app yet will have to shell out a bit more, the price has been raised to $1.95. This is to try and keep new numbers down so that the 100,000 limit isn’t reached as quickly again. You may want to hurry and refresh your token as soon as the update is live with Twitter’s limit looming. We’ll try to update this post as soon as that happens. Update: The update is live. Go get it and re-login!